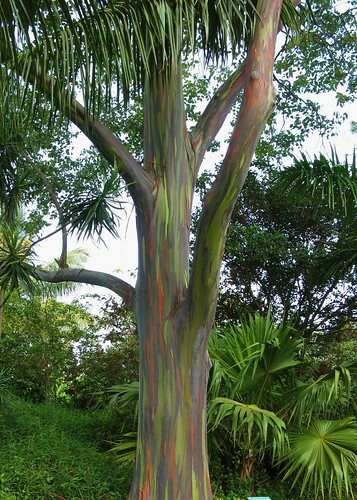 Rainbow Eucalyptus, Mindanao Gum (Eucalyptus deglupta). Eucalyptus deglupta Blume is a huge evergreen tree from the seasonally-wet humid tropics. Indigenous to Indonesia, Papua New Guinea and the southern Philippines, it grows to more than 65m (213ft) and upwards of 2m (6.5ft) in diameter. Away from its environment, it rarely exceeds half this size. It is the world’s fastest-growing forestry tree, cultivated mainly for pulpwood on plantations throughout the tropics. It also provides a source of hardwood timber for use in cabinet-making, construction and joinery. In the Philippines the even-textured wood is known as “Bagras” or Southern Mahogany and in Papua New Guinea, “Kamarere” is a major export timber. E. deglupta is one of four eucalypt species not endemic to Australia, and is the only eucalypt to occur naturally in the northern hemisphere. 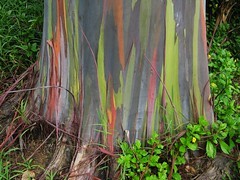 As an ornamental specimen, E. deglupta is popularly admired for its multi-coloured “painted” appearance, from whence the common name, “Rainbow Eucalyptus” originated. Fine layers of bark exuviate in strips of varying shape and size, revealing a smooth, white to pale green surface, which with age turns to vibrant green, grey, pink, red, orange, blue, and purple. The rainbow effect is most impressive on habitat specimens, and tends to diminish the further the tree is found growing from the tropics. Grow your own from seed!